1. 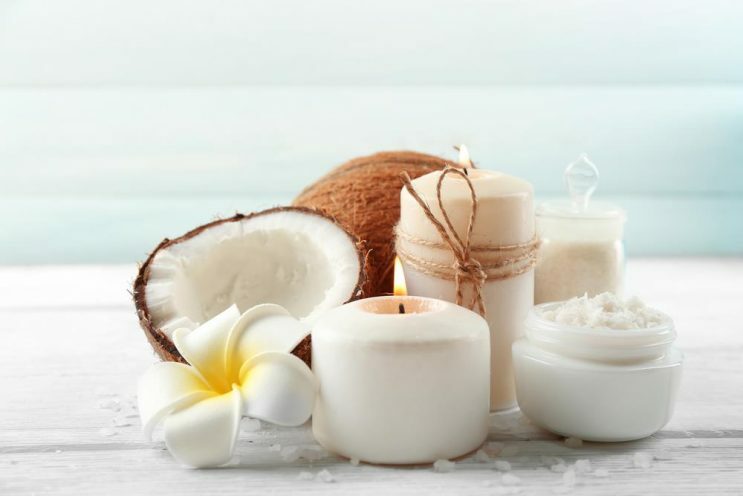 What are benefits of coconut oil? 2. Why do I have to remove coconut oil from hair? 3. How to get coconut oil out of hair by using shampoo? 3.2. Now you are ready. Let’s get started! 6. How to wash coconut oil out of hair without shampoo? Have you ever wonder how to get coconut oil out of hair after using it? 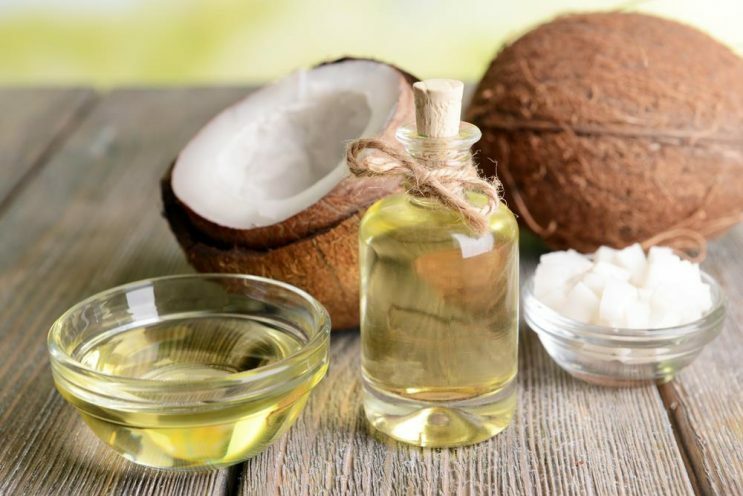 Despite incredible effects, coconut oil frequently leaves behind an oily and unprofessional hair. This might be the biggest problem that almost girls encountered. Don’t worry, because this article will show you how to get coconut oil out of hair by the fastest and easiest way. What are benefits of coconut oil? For any girls with a short and thinning hair, this is the perfect option to make it longer and thicker. Massage your scalp by coconut oil help boost the blood circulation, thus stimulating hair growth. It is better to apply coconut oil to your hair roots with a cotton swab before massaging for the best absorption. Dandruff appears when your scalp is infected by yeast-like fungus, bacteria, or allergic to any hair care products. Dried skin also lead to this annoying condition. With fatty acids elements, coconut oil prevents dandruff by moisturizing scalp surface and reducing fungal and bacterial infections. This excellent conditioner is suitable for all types of hair. You can apply an adequate amount of coconut oil on your hair, let it sit for 20 minutes before rinsing with warm water. Coconut oil is also a useful mask which keeps your hair smooth and shiny. Hair dryer, iron, or hot roller may cause frizz and damaged hair. By applying a tiny amount of coconut oil on your hair shaft before designing, it will be much more manageable and healthy. Using coconut oil before bleaching hair is a smart solution. Bleaching your hair can cause terrible damages to hair structure. Coconut oil is one of the most natural hair care that protects your hair from chemical and physical interventions. Soak your hair with coconut oil for couples of hours before bleaching brings up the best result. Coconut oil is a potential treatment for lice without scalp irritation . It keeps your hair away from lice and their eggs by penetrating the hair shaft and the scalp. The recipe for lice treatment includes coconut oil, ylang-ylang, anise, and tea tree oil. Apparently, this is the ultimate benefit of coconut oil. Including plenty of antioxidant agents, nutrients, and vitamins, coconut oil will maintain your hair at the strongest status. This oil even reduces protein loss more effectively than sunflower oil and mineral oil . Besides, coconut oil for curly hair is a perfect choice, especially for those with dry tight curls. It penetrates into hair stains and keeps ringlets hydrated, healthy and shining. Why do I have to remove coconut oil from hair? Despite outstanding benefits, the drawback of coconut oil is a concerned problem. Apparently, nobody wants to go out with an oily and unclean hairstyle. It looks so unprofessional and unhealthy, which may affect your work and social relationships. Besides, the extra amount of oil in your hair attracts the dust and makes your hair becomes frizzy and heavy. If it is left unsolved, the oil can block pores in your scalp and results in itching and irritating. This situation is even worse for people with oily skin. Fortunately, you don’t have to worry about that anymore. Keep using coconut oil to take care of your hair as usual. We will guide you step by step how to wash coconut oil out of hair in just 5 minutes. How to get coconut oil out of hair by using shampoo? Before you start, we recommend you to prepare these listed things. They are all household items, or at least available in the supermarket and cosmetic stores. This is a powder form of regular shampoo. It absorbs the excess oil in your hair almost instantly. They even produced coconut oil dry shampoo in spray form to serve coconut fans. If you don’t have this item in your house, you can replace it with cornstarch or baby powder. It is a unique shampoo designed for deep – cleaning purposes. Clarifying shampoo eliminates dirt and extra oil in your hair effectively. Choose well-known brands, so they combine detergent elements with hair nourishment not to harm your hair. However, it is not suitable for dyed hair as it might remove the original dye color. If you own a dyed hair, we don’t recommend using this item. Only use your daily conditioner. This hair care product is very useful to remove coconut oil even if you use it independently. The brush keeps your hair at the perfect volume without flattening it. If you don’t have one, use comb instead. Now you are ready. Let’s get started! Keep your hair dry. Sprinkle an adequate amount of dry shampoo on your hair roots. Then use the brush to distribute the powder toward the ends. The roots of your hair are usually greasier than the ends, so they need more powder to absorb the extra oil. The amount of dry shampoo depends on the length of your hair, but about one tbsp. is necessary. Wash your hair by clarifying shampoo and water. The active detergent in clarifying shampoo help remove almost the excess oil completely. But using clarifying shampoo too regularly is not recommended, because it may harm your hair. If you have time, let the shampoo sit in your hair for 5 minutes. This is when detergent compounds in clarifying shampoo break fatty acid molecule structures in coconut oil. If you overused coconut oil previously, you may want to repeat the washing process to make sure there is no more oil in your hair. Rinse your hair gently with warm water. It is time to use your conditioner. Thus the coconut oil hydrated your hair roots perfectly, you just need to apply conditioner on the hair ends. Use a coin – size of conditioner on the hair ends to prevent moisture losing after using the clarifying shampoo. Rinse your hair again under warm water. It is essential to use warm water in this situation because it melts the coconut oil and makes it removable. Cold water will just harden the oil and make things worse. Use a soft towel to dry your hair. Do not rub the towel or it will create frictions, just blot dry by dabbing your hair with the towel. You can squeeze your hair gently to remove the remaining water. After that, let your hair dry naturally, or use blow-dryer at the middle setting. Now, enjoy your gorgeous look and ready to hang out! Step 1: Divide your hair into different sections by using the point of your fingers. Start at the top of your ear and drag forward to separate it into front and back parts. Step 2: Keep dividing the front parts into parallel sections. Sprinkle dry shampoo at the hair roots of each section, then flip over the other side of your head. Repeat the process with the back parts of your hair. Step 3: Move your head down to put all of your hair upside down. Blend the powder by shaking the roots in zigzag ways. This step makes sure the powder is fully blended and reach to the ends. Step 4: Finish by using an oval brush to glide from the roots to the tips of hair strands. From now on, limit touching your hair to maintain the best hair style. It is very easy to create your own flavor dry shampoo. First, put 5 drops of essential oil into the cornstarch or arrowroot powder. Mix it well with a spoon, then store the mixture in an airtight container. After that, follow the 5–minute–tip above, but use the makeup brush to apply the powder instead of sprinkling. How to wash coconut oil out of hair without shampoo? Well, in case you don’t want to use shampoo to remove coconut oil from your hair, there are several home remedies for you. 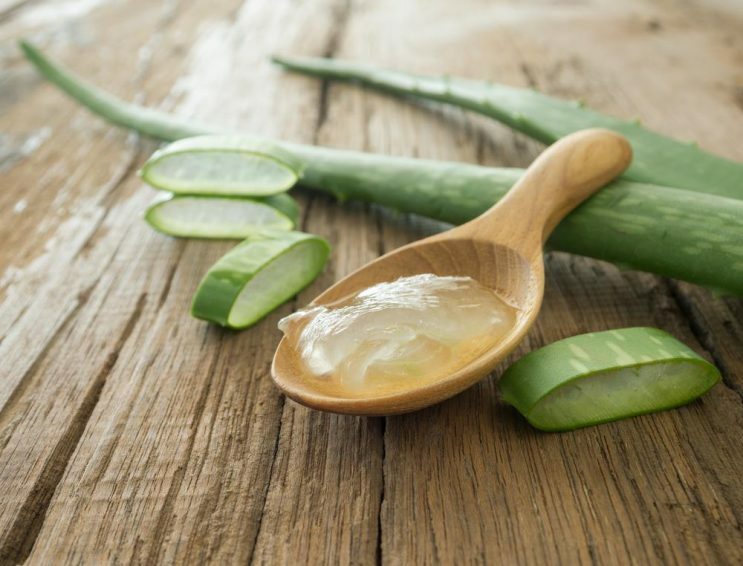 With popular uses, Aloe Vera is a beneficial natural shampoo for all types of hair. It removes extra oil from hair strand effectively while still keep your hair moisturized and hydrated. The cleaning effect of Aloe Vera is boosted with the combination of lemon juice. Begin by adding 1 tbsp. of Aloe Vera gel with 1 tbsp. of lemon juice. Apply the mixture on your hair for 15 minutes, then wash it with lukewarm water. The egg yolk contains lecithin, which emulsifies coconut oil with water. After that, the excess fat will be removed after rinsing, bring back a clean and smooth hair. High source of proteins and vitamins in egg supply nutrition for hair strand, results in a shiny and healthy hair ever. To prepare, mix 1 egg with 2 tbsp. of water, then use the mixture as a hair mask. Let the mask sit for about 10 minutes. Finish by rinsing your hair with lukewarm water. Lemon is a reasonable solution for a greasy and dirty hair. 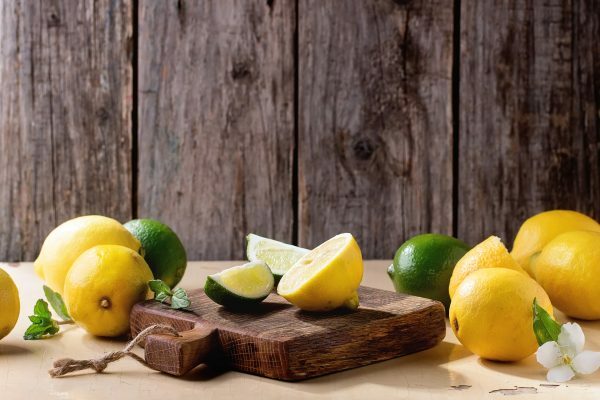 The astringent effect of lemon not only balances oil consumption in the scalp but also wipes out extra oil. Besides, antibacterial and antifungal elements in lemon solve the lice and dandruff problems. Mix 4 tbsp. of lemon juice with 2 cups of water. Strain the mixture to prevent fruit bits from sticking to your hair. After that, apply this mixture on your hair and massage gently for about 3 – 5 minutes. Finally, wash your hair thoroughly with warm water. This method should be used once to two times per week not to dry your hair. A principal ingredient in vinegar is acetic acid, which is also a part of many clarifying shampoos. This element prevents dead skin cells and oil from attaching your hair roots and scalp. With the limited amount and low – cost price, vinegar is a suitable solution for greasy hair. To prepare, add 2 – 3 tbsp. of vinegar (apple cider vinegar, for instance) into a cup of water. Mix the liquid thoroughly, then put the mixture into a spray for easier application. Spray to your hair roots and strands, and allow it to sit in your hair for 1 – 2 minutes. After that, rinse your hair carefully with warm water. However, these methods usually remain uncomfortable odor after using. Unless you feel free with it, we recommend you use shampoo as the easiest and fastest way. If you haven’t used coconut oil before, start with a small amount. Unless you know exactly what your hair needs, it is better for you to test and see how your hair responds to the coconut oil. Coconut oil gets solid in cold temperature. Make sure to warm it up with your palm before applying. This step prevents a large amount of coconut oil sticking in your hair. Use quality coconut oil. The virgin coconut oil should be colorless and have a natural odor. In contrast, refined coconut oil owns light yellow color with a smell of artificial compounds. Do not leave coconut oil to stay too long in your hair, or it will block pores and cause irritation. Using coconut oil mask 1 – 2 times per week brings up the best result for your hair. How to get coconut oil out of clothes? This is another way that coconut oil may disturb you. To deal with this problem, use a clean towel to blot the excess oil in your clothes. Then sprinkle baking soda, or cornstarch onto the stain and leave it to sit for 10 minutes. These powders absorb the oil efficiently. Finally, use dish soap to wash your clothes under warm water. Now, your clothes are completely clean. Conclusion, removing coconut oil from hair is not that difficult if you follow our instructions. After reading this article, you know how to get coconut oil out of hair by the easiest and fastest way. Hope that this information is useful and fully provide what you are searching for. We hope this article useful and valuable for you. Thus don’t hesitate LIKE and SHARE it to your friends.